"A fresh selection of veggies and spices blend in our Chicken Casserole. It's a chicken recipe that will leave you full--and extremely satisfied." Season chicken, if desired, with salt and pepper. Heat oil in deep, large skillet over medium-high heat and brown chicken. Add onion and garlic and cook, stirring occasionally, until onion is almost tender, about 4 minutes. Stir in carrots, zucchini and green onion and cook, stirring occasionally, an additional 5 minutes. Combine boiling water with Knorr(R) Rice Sides(TM) - Chicken flavor in 13 x 9-inch baking dish. 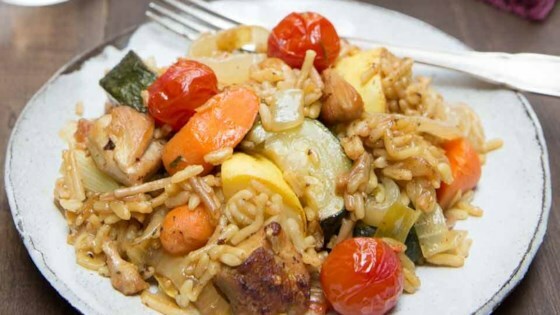 Stir in vegetables and chicken. Cover tightly with aluminum foil. Bake 30 minutes or until chicken is thoroughly cooked and rice is tender.